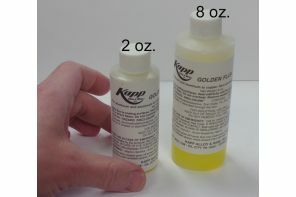 Kapp Liquid Golden™ Flux has been designed specifically for KappAloy9™ and KappAloy15™ low temperature soldering of Aluminum to Aluminum, Copper, and Stainless Steel. This flux is golden colored, chloride-free, and organic based containing 56-60% active ingredients consisting of amines and complex inorganic fluorides. Effective fluxing action occurs at 350-550°F (177-288°C). Kapp Golden™ Flux will char at temperatures above 550°F (288°C). Residue is electrically conductive and slightly corrosive. We recommend that user remove any residue with hot water or alcohol and a clean rag. The following chart represents the physical properties of Kapp Golden™ Flux. Many factors, such as materials, temperature, and method of application determine the most effective flux. We recommend testing appropriate fluxes in your specific application to ensure suitability. 2 years unopened at ambient temp.